Crazy Convergence, Part 3: The Gamerator!!! I promised one more bit of crazy convergence, and if this doesn't deliver, I don't know what will! 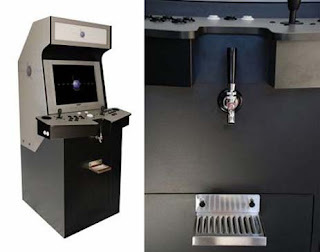 This, this, is a home arcade machine with a kegerator and beer tap built right in. Sure, the previous post about liquids and electronics was cautious, but the Gamerator clearly trumps fear with awesomeness. So it turns out that sometimes, even though convergence might be crazy and not really rooted in logic, it can bring a smile to the face of even the most cynical consumer!